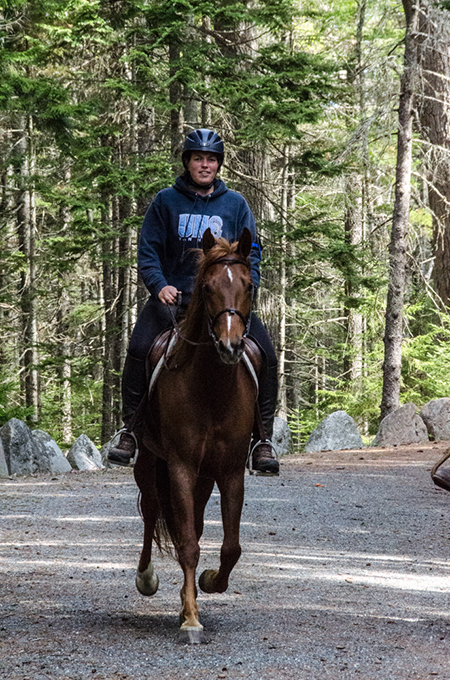 Stacey Stearns describes trails in New England's Acadia National Park as part of Equitrekking’s 50 State Trail Riding Project. You can’t get there from here. Well, you can, it’s just a long drive. But it will be worth it. Acadia became a national park in 1919 and is the only national park in New England. The park is 47,000 acres and located on Mount Desert Island in Maine, near Bar Harbor. John D. Rockefeller Jr. and his family gifted 45 miles of beautiful carriage roads to the park. Rockefeller was a horseman and wanted to travel in the park without a car. He also loved building roads and ensured the carriage roads in Acadia would be state of the art. Construction lasted from 1913 to 1940 – but the roads offer sweeping vistas and close up views to all park users. The carriage roads weave through the mountains and valleys of the park, over intricate stone bridges, and past the many ponds. Rockefeller also financed 16 of the 17 stone-faced bridges. They are reinforced with steel and concrete, and the design of each bridge is unique. 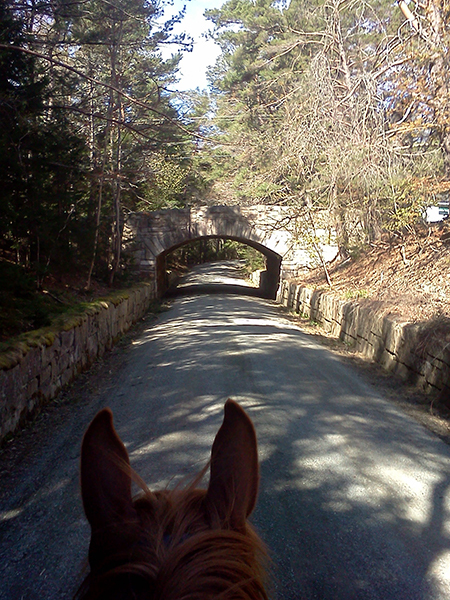 There are 57 miles of carriage roads total – 12 of the miles are on private property. The roads are 16-feet wide, the same width as a regular road. They are crowned, meaning they are tallest in the middle, allowing precipitation to run to the ditches and culverts on either side. Stone culverts help the carriage roads contend with rain, and divert rainwater back to the streams. The Civilian Conservation Corps (CCC) began working in the park in 1933 and helped build the carriage roads. Their camp near Eagle Lake is now the park headquarters. The Friends of Acadia contributes $200,000 each year from their endowment for carriage road maintenance. The best directions are using the GPS coordinates available on the park website. You’ll need to purchase a park pass; they’re $25 for 7 days for a non-commercial vehicle. Passes are required from May 1st through October 31st. 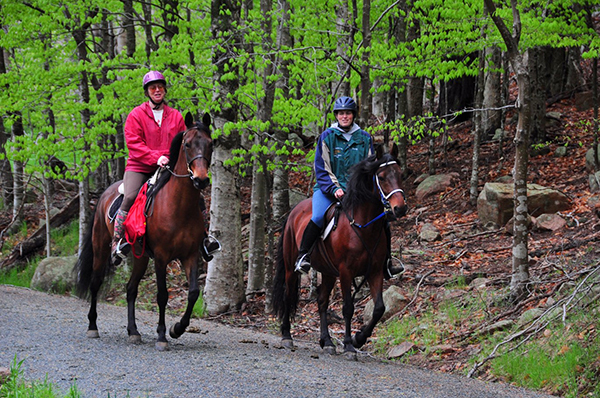 Print the carriage road map and carry it with you while you ride. Many areas have no cell service. Wildwood Stables is located within the park and offers 34 stalls for rent to equestrians. 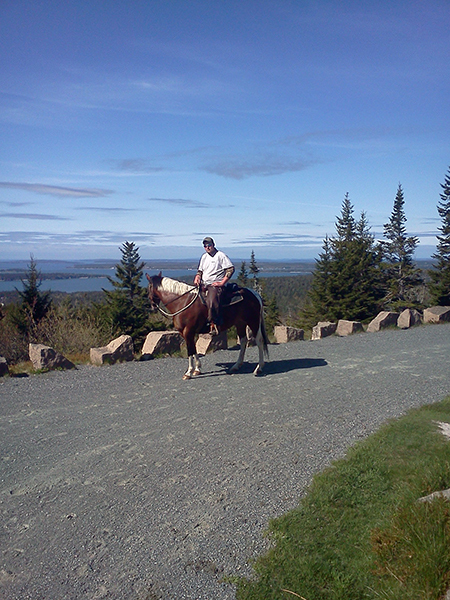 You can access the stables from the Park Loop Road; it’s in the southeastern part of Acadia. Private concessionaires run the stables for the national park. You can also camp across the driveway from the stables. Stalls fill quickly, and it’s best to call soon after the January 1st opening date to make your reservations. Wildwood Stables also offers one and two-hour carriage rides through the park for those without their own horse. The Park Loop Road is 27 miles long, and in many places is one-way. Some two-way traffic is near Wildwood Stables. You can park at Wildwood Stables or Brown Mountain parking lot if you’re only visiting for the day. You must clean up any manure around your horse trailer before you leave. I recommend hoof protection; the loose gravel on the carriage roads can be tough on hooves. 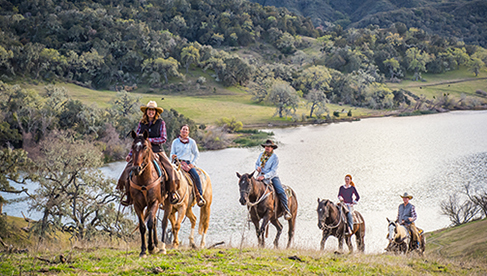 If you want to give your horse a day off, there are 120 miles of hiking trails within the park. Make sure you carry water with you while out riding or hiking. The hiking trails are off limits to horses. 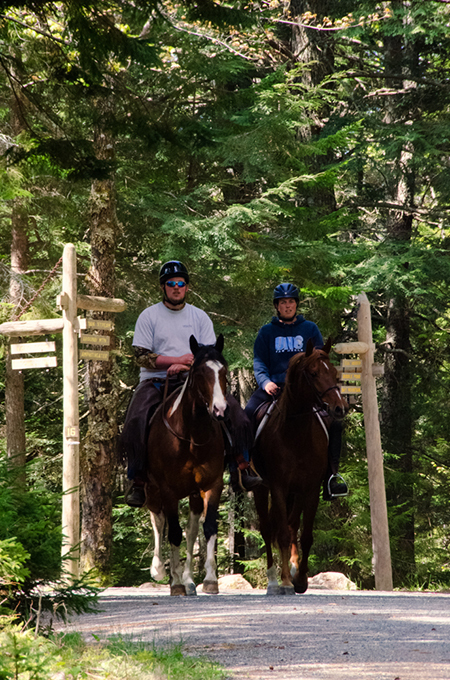 A couple of carriage roads horses aren’t allowed on include around Witch Hole Pond, Paradise Hill Loop, and Eagle Lake Loop. 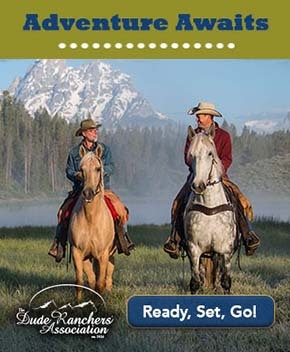 You can ride horses between markers 7 and 8 by Eagle Lake, which allows equestrians access to additional miles. Cadillac Mountain is the highest point on the North Atlantic seaboard at 1,530 feet. From October 7 through March 6 it’s the first place to view the sunrise in the United States. It’s one of 20 mountains on Mount Desert Island that were created millions of years ago by tectonic and volcanic forces. While you can’t ride up the summit road, it’s well worth the drive someday while your horse is back at Wildwood Stables. The 3.5-mile road has several observation points along the way and spectacular views at the summit. Granite rocks shaped as teeth and rectangles irregularly line the carriage roads in places and serve as guardrails for safety. They’re affectionately known as Rockefeller’s teeth, although the real term is coping stones. Cedar signposts at intersections correspond to the numbers on the map and help all trail users find their way. Native plants including blueberries and sweet fern blend the carriage roads into the landscape. The fall foliage is stunning, making the scenic vistas even more enjoyable. The first time I rode at Acadia, many of the vistas were shrouded in fog on day one. If you plan a couple of days for your trip, you’ll be sure to catch a few of the views. 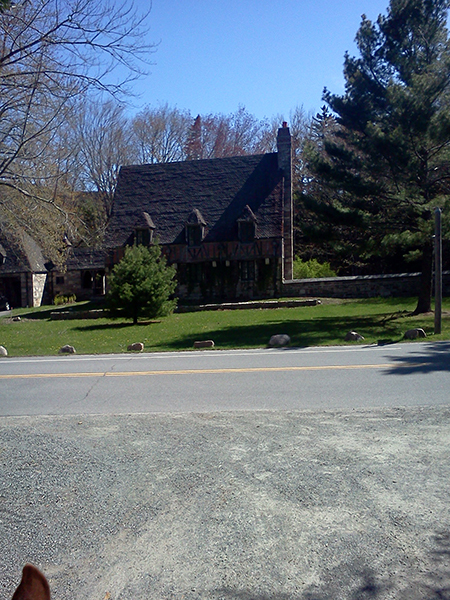 The first time I drove by Jordan Pond Gate Lodge I was completely enamored with the stonework and façade. Jordan Pond Gate Lodge remains a favorite spot to ride past. There is a second gate lodge near Northeast Harbor. Paul Simpson, an engineer, lived in Jordan Pond Gate Lodge with his family during road construction. Today there is a food concession and restrooms. One of my favorite loops is to ride up along the carriage road parallel to Jordan Pond, then, along the southern end of Eagle Pond, from marker 8 to marker 7, and back down past Bubble Pond. You ride over three of the stone bridges on this loop. Another loop goes west of Jordan Pond and crosses many of the bridges. Riding up Day Mountain gives stunning views of the ocean from several vantage points. Carriage roads near Seal Harbor let you get closer to the ocean and smell the salt on the breeze. As one of my friends said before my first ride at Acadia, you’re either going uphill or downhill the entire time. 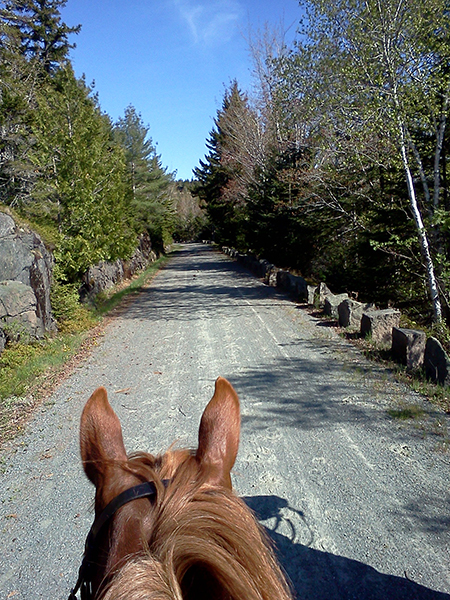 The beautiful gravel trails are deceiving, it doesn’t always feel hard, but your horse is working. Go easy and happy trails!